Shipping world wide from our New Zealand warehouse. Earn 1.74 Weta Dollars! What's this? Winner of seventeen Academy Awards, The Lord of the Rings was brought to the big screen by New Line Cinema and directed by Peter Jackson. Weta Workshop was intrinsically involved in the design and physical effects manufacture for all three films. In The Lord of the Rings: The Fellowship of the Ring, a meek Hobbit and eight companions set out on a dangerous journey to destroy the One Ring and the Dark Lord Sauron. 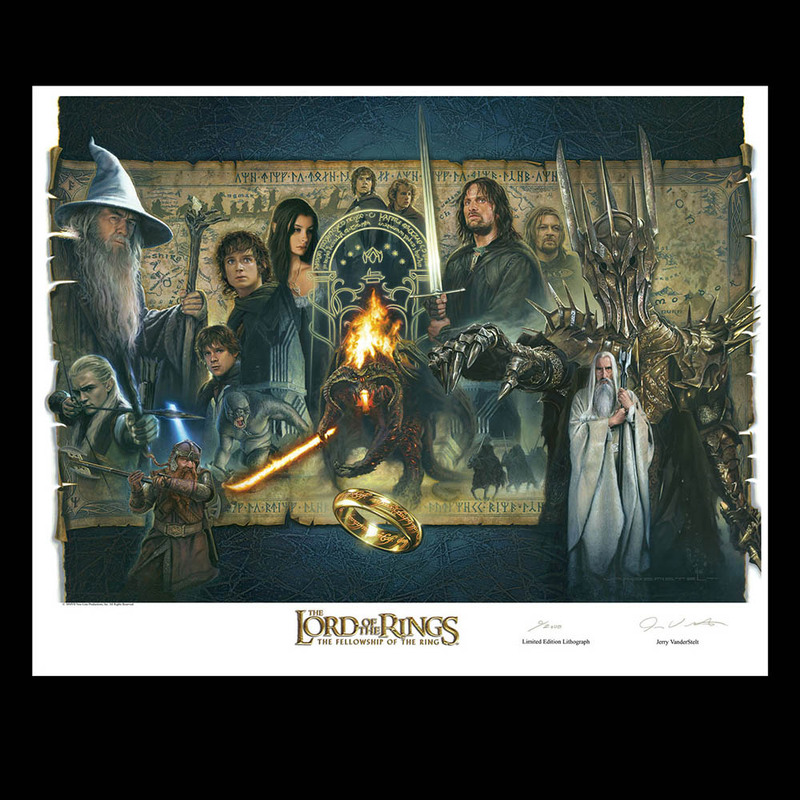 This beautiful The Lord of the Rings: The Fellowship of the Ring paper lithograph is by artist Jerry Vanderstelt. Paper Editions are limited to 2,000 pieces worldwide. There are people of extraordinary talent operating in today's world that have similar skills as the great masters of yesteryear. It just happens to be that the canvas that they paint on is the darkened screen of the cinemas of the world. These lithographs are printed on a Heidelberg press using 200 line screen for superior reproduction quality, finalized with an aqueous coating for a protective finish. Each paper lithograph is made with heavy 100 pound White Mccoy Silk paper. The detail in this piece is so awesome. A true must for any Lord of the Rings fan!"